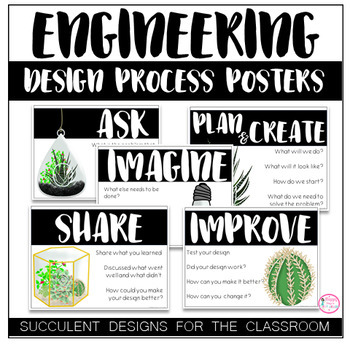 Compliment your calming classroom with these Engineering Design Process Posters with Succulent Designs! This file comes with 6 signs that are ready to be displayed. Use these posters throughout the year to review and reinforce the STEM thinking in your classroom! If you are purchasing this file for multiple teachers, please buy the additional licenses as it is required by TpT and helps protect my time and work. To receive credit for future purchases, go to the My Purchases page and click on the Provide Feedback button beside each purchase. Once you have rated the product along with a brief comment, you will receive TpT credits which you can use for future purchases. To receive UPDATES ON NEW PRODUCTS, DISCOUNTS, SALES, and FREEBIES, click to the GREEN star by my store's name to follow me! If you have any questions, please feel free to email me at happydaysinfirstgrade@gmail.com.